This topic contains 64 replies, has 12 voices, and was last updated by William Summers 1 week, 3 days ago. I’m starting this topic as a place to put general enhancement suggestions (not feature requests). If you find it valuable, perhaps it could become a “sticky” topic that always shows near the top of the Forum topics for DFFS so it is easy for users to find. 1. Change the naming of new versions of DFFS to the format YYYY-MM-DD so that when we download the zip files, they will automatically sort in chronological order. (Right now, I sometimes remember to create a new folder for each new download and use that date format as the folder name, but making it a standard would simplify the process of knowing which release is the latest. 2. Instead of using html files for CEWP links, use text files. For example, instead of Installer_CEWP_code.html make it Installer_CEWP_code.txt. The advantage of using a txt file instead of an html file is that a user can see and modify the contents of a txt file much easier that an html file. For instance, in the current environment I work in, html files will not open in the browser, but instead I must download the html file and open it from my hard drive. I recognize that for backward compatibility when upgrading from one version to another of DFFS you might have to maintain both an html version of the file and a txt version of the file, so it might not be worth the extra work to do so. 3. Create a ‘sticky’ topic in this forum for bug reports and/or beta testing reports. This topic was modified 2 years ago by Alexander Bautz. Sorry for the late reply – I’ve been busy trying to sort out a few issues with the latest BETA. This is good ideas and I’ll stick it to the top – and will look at changing the “naming” of the future DFFS versions. Thanks for making this a sticky post! If possible, I’d like the ability to restore a previous version of the DFFS configuration from the DFFS new/edit/display config page. I know we can use versioning in the SPJS-DynamicFormsForSharePoint list to restore a previous version, but I’ve had a few occasions where I’ve been in the config page and wished I could revert from there after testing a change. 1. Provide an easy way to know which version of DFFS is installed in the DFFS folder within the SPJS Library. I do this for myself right now but simply adding a text file with a name that reflects the version. For instance, my most recent installations have a text file in the DFFS folder named “DFFS version 2017-02-25.txt”. This lets me know at a glance which version of DFFS I am using. When I download a new version of the DFFS files and unzip the zip file, I rename the DFFS folder to include the version date. This way, I can have several versions of DFFS installed in a single site and switch between them almost instantly simply by changing the folder names. Whichever folder is named “DFFS” (without any date component) is the active version. Request to Alex: please include a text file (like I have explained above) in future versions of DFFS to give users an easy way to know which version of DFFS is installed. As this feature requires some changes to the code it will unfortunately only work when updating past the upcoming revision. This new revision has been delayed many times, but will hopefully be ready for BETA this weekend. Desired enhancement: Easy copying of New form config to Edit form, or vice versa. When I am building a complex form, I usually work on just one version of the form (for instance, the EditForm), and when I reach a point where the form is fairly useable, I will clone the EditForm to create the NewForm. It would be great if we could have a button like “Copy Edit Form Config to New Form” to save a few steps when trying to keep the New and Edit forms synchronized. In the upcoming version I have added a new functionality to create restore points and to browse existing restore points. This feature is intended used to do exactly what you require. See attached image. It would be great to have the option to specify the scope of search within the lookup list/library for vLookup functionality. Currently the query created has RecursiveAll scope. Since there is an option ‘Add new items to this folder (Document libraries only)’, it would be really good to have an option to either search for items in all folders or specify particular folder. 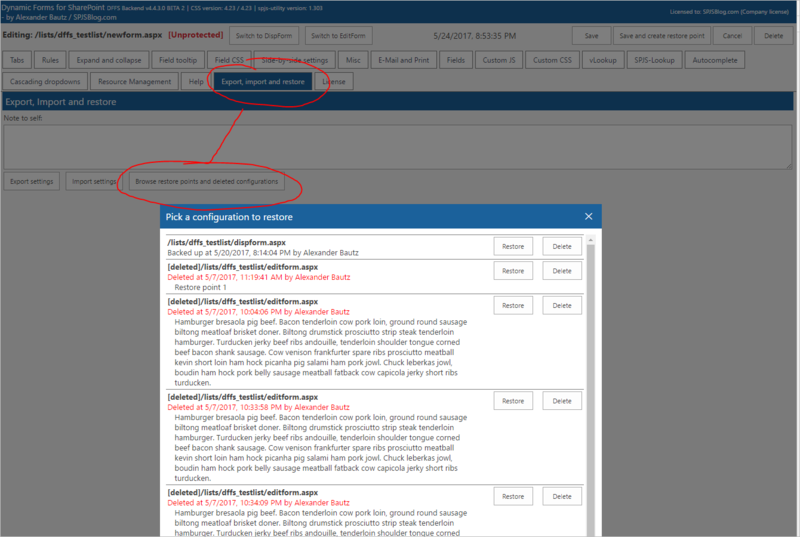 This would help resolve issues with libraries having over 5000 items on SharePoint Online. Let me know if you need any help with that. I am a SharePoint developer myself and be glad to contribute. This reply was modified 1 year, 9 months ago by Konrad Kołodziejak. Thanks for the feedback. I’ll see what I can do about adding an option to specify the folder to search in for vLookup. The current code base for vLookup is not fully optimized for SP 2013+, and I have plans to completely rewrite vLookup and make it an integrated part of DFFS. I’ll keep this in mind for the next version. PS: I appreciate any feedback you have, so please post your suggestions here, or email them to me. It would be great, if the minified version of scripts from plugins folder were loaded. It would speed up the load time of assets and therefore shorten the time of overlay being displayed. There could be a setting (debug mode) that would make the unminified plugins load instead of minified ones. I have minified vLookup as this is the biggest files, but I’ll try to get all files minified for the next version. I know responsiveness is something you already looked into and thought about. What are your thoughts on CSS Grids? I only recently started using them, but I really like them and from my imagination they could be an option for DFFS too. Sorry for not replying earlier. I cannot use this approach in the current DFFS version because of how the original form is manipulated, but have plans for responsiveness in the next major release. Unfortunately I’m so busy supporting and maintaining my solutions and haven’t been able to get the momentum I hoped on the new version. Would it be possible to add functionality to support branching of DFFS? There are deployments where it is not practical to have dev/test/prod environments. We have to develop new functionality in production. It would be great if we could “branch” the dffs configuration, make changes, test it, then publish it as the production version. We could use a query string or cookie to indicate whether to use the prod or dev branch when accessing forms or configuring. The “enhanced with DFFS” tag could be updated to show which branch you are using and allow you to select a different branch. To get extra fancy, this branching may be done at a view, list, web or site collection level. You could also include special branch tags with include files if you want to make them branch specific. Obviously, any list configuration changes would affect all branches. This reply was modified 1 year, 4 months ago by Ivan Wilson. This is a good idea, and I have actually already planned to include more or less what you ask for. I haven’t finished it yet, but will try to get it out soon. If possible, I have been asked if once the form is Saved either in the ribbon or via button at the bottom, that the user be returned to a specific URL, like a homepage or thank-you page for example. Is there there a script that I can add to to the EditForm.aspx page? Perhaps this can be added in a future release in the Misc Tab? The redirect will be performed when saving the form. Thanks for replying but I get an error in Custom JS textarea. I’ve tried in both Edit and Display Custom JS areas. I have version 4.373, should I upgrade to the latest DFFS? If the output reads “undefined” you must update DFFS to the latest version. I have upgraded to the latest DFFs and the redirect is now working. Would it be possible to have the prev/next tab buttons at the top of the form, or both top and bottom maybe? The easiest way to achieve this is to add this snippet to your custom js. You don’t need to use the Misc settings if you only want the buttons in the top. It would be nice to be able apply the configuration to the other two forms with one click of a button if possible. I’ll see what I can do about a button to push it to the other forms, but you can use this method to share the same config for all forms in a list – just create an unique ID in the “dffs_formIdOverride” variable and insert this snippet in a script editor in all three forms. It would be nice if the txt file at the root of the DFFS folder that shows the release date could also contain the version numbers of each of the component files. Right now, they only way I know to check the version numbers of a release is to install it and open it, or perhaps hunt through the Change Log on the spjsblog.com site. This file is used to quickly see the version date and changed files. Good idea – I’ll do that in the next release. I’m wondering if it’s possible to have a single column being displayed more than one time in the same tab? Currently we’re doing this via custom code, but it’s not that easy. This reply was modified 1 year, 1 month ago by Andreas Blüher. Sorry, but you cannot have the same field multiple times in the same tab – different tabs is not problem though. Thanks for your reply. Would it change anything if the 2. appearance would be read only by default? Have you thought about some kind of “light configuration” option? DFFS backend can be pretty overwhelming. I would like to have some special users which are allowed to add/remove fields, but to do nothing more. Is something like this possible? This is currently not possible, but I’ll make a not of your request and see if I can add support for something like this in a future version. Would it be possible to have a tab option to set all fields read-only on the tab? I know you can set separate rules by tab index but it does require the additional maintenance when columns are added to the tab or deleted from the list. Clients have requested this (not too sure on the use cases for it). Please note that the fields will stay read-only when you change tabs – you would have to set the fields as editable again in the other tabs. it would be really nice to be able to copy entire sections. Example would be a check box that you can copy the heading, fields under it because you want to move the entire section up or down the form or maybe even move it to the edit form from new. This is a good idea, and it is already on my list of things to add to a future version. There is probably already an easy way to do this but it would be nice to have an easy way to target the DFFS Print page for CSS changes. Would you be able to include a class or id in the following? This reply was modified 10 months, 1 week ago by Ross. Easy way to copy a single rule (or selected rules) or a single tab (or selected tabs) from one config to another. Alex, I’ve had some developers who have been working on some very complex forms ask me if there is a way to copy a single rule or a set of rules from one config to another (for instance, to copy a rule developed in the New form config and copy it into the Edit form config). I have sometimes also wished there was an easy way to copy just one tab from the New config to the Edit config. I will include this in the next release. Easy way to “pause” a splash (overlay) screen. We have encountered a situation where we would like to be able to include simple instructions to our users on the overlay as the form is opening, and control how long the overlay shows. Could you add a setting for that? Good day Alex, I don’t see this anywhere but it would be nice if we had an option for setting an entire tab index to read only based on a rule. Now that I think about it if I had the code or function to hide a tab that would be awesome as well! William, I just saw this about code to hide a tab. The id of the tab is “dffs_tab_5” where 5 is the tab index. So, you can just use $(‘#dffs_tab_5’).hide() to hide tab with index 5. I currently exploring DFFS by using the Training application example from this site. An enhancement could be the procedure to install the DFFS_Email list. In order to get the full functionality I have to use SharePoint Designer to create the workflows in this list. But the policy of our organisation is: “Use of SharePoint Designer is not allowed and therefor disabled”. I make use of SharePoint 2013 server. Is this possible to implement? I looked at the article you lined to – I have not tried this before, but from what I could find I will be a bit difficult to build the entire workflow with code. Are you not able to use the REST email option? (the default method if you do not check the Use custom list with workflow to send E-Mails checkbox)? Sure, the REST email option works, but it is not possible to send the mail later. I’m working behind a firewall without the possibility to install tools as smartCAML for building and testing CAML queries. Use of SharePoint Developer and Visual Studio are not allowed for client side developments. The approach used by spjs opens the possibility to build client side applications as a CAML query builder. I’m sure it can be done, but unfortunately I don’t have time to build something like this. You find resources online regarding CAML queries, and you can always post a question in the forum where you describe what your want the query to do, and I’ll try my best to help you. In our SharePoint groeps we are using Active Directory groups for granting access to SharePoint sites, directories and mailboxes to persons working on certain functions in the organisation. When a person is added to such an AD (role) group he get in one step all neccesary access autorities without bothering to enter it in all the systems. 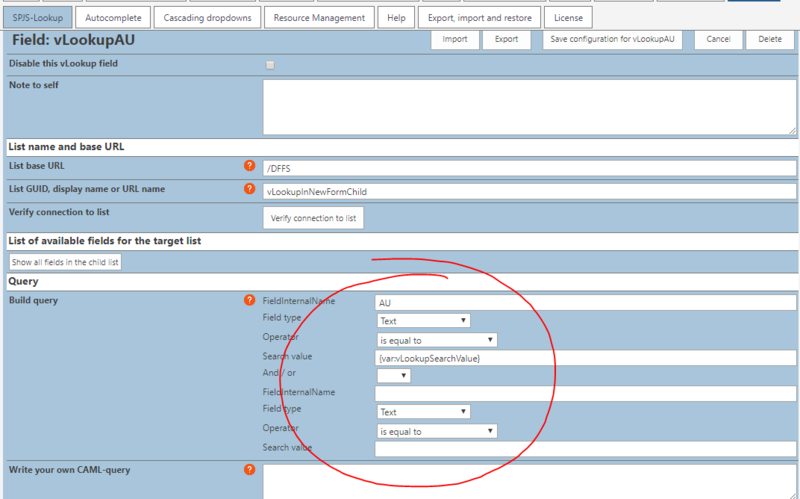 In the rule section one can make a tab visible for a certain SharePoint group. But I found out that DFFS does not resolve the AD groups in these SharePoint groups. Adding a userprofile to the SharePoint group will do the job, but that involves a lot of maintenance and that is not what we realy want. Is it possible to resolve the membership through the AD group until a userlevel is reached? Is it correct that this workaroud algorithm is not implemented behind the Tab instruction: “Which groups can see this tab?”. Because that was the mean reason I’ve made this suggestion..
And if not: is it possible to add? Yes, you are right – this is not built into DFFS. Using vLookup from the New from when no ID is needed. My user asked how to create the equivalent of an Infopath Repeating section in DFFS. The example she gave me was based on the child records sharing the same AU (stands for ‘Accounting Unit’, similar to a GL code in an accounting system) as the parent records, which doesn’t rely on the ID of the parent record OR the ID of the child record, but I still had to add the _vLookupID column on my parent list for the vlookup config to work. If it is easy to turn off that validation when someone is not using the ID column on the parent list to relate to records on the child list, it would make setting up the lists easier for my user’s use case. A table of some applications and the AU’s they fall under is already available so the child list could be pre-populated through a bulk load. When adding a new manager to the parent list on the new form, immediately all the applications supported by that manager would show up on the form. Apps supported by the manager’s team NOT already pre-poplulated would be added individually on the parent list new form. At no time would the ID of the parent record be needed to find the related records on the child list. I’ll remove the limitation that makes you have to add the _vLookupID column when using vLookup in NewForm in the next release because even though you must add the column, you don’t have to use it in the query – so this check is not necessary. Here is a code snippet you can use to pull a user info (user list in SP) or user profile (user profile service) value from a people picker and use it to search a child list for matching records where the user info / profile property is found in a text field called AU. Change Manager to match your people picker internal name, Department to match your user info / profile property and vLookupAU to match your vLookup column internal name. This snippet uses the user info list, but if you like to use the user profile just change the line starting with var ui = to the commented out line. Create a rule that triggers on change on the Manager people picker and add refresh_vLookup to the Run these functions / trigger these rules field. Then you change your vLookup settings like the attached images. I have an idea that I don’t think currently exists. Could it be possible to set a default Custom CSS for every form? Right now, I copy my CSS from every single form onto any new forms I create. I’d like to see a way that I can have a default CSS automatically applied to every instance of DFFS I have, and then I can do further Custom CSS for the specific list from within the backend. Travis, I think you could accomplish that with existing functionality quite easily by using the “Load these CSS files ” section in the Custom CSS settings page in the DFFS configuration for your forms. Save your custom css as a css file, store it in your SPJS library, and then just add the reference when you create a new form. I *THINK* there is even a way to add it to the “Plugins” folder in the SPJS library so it is automatically included in every form. Check the DFFS manuals (Installation and User Guide) online. @Keith: Your are right that you could to this earlier by adding it to the “custom” folder in /SPJS/DFFS, but this was deprecated when I added the “Load these files” above Custom JS and Custom CSS. good day. working with cascading using multi select I find something to be cumbersome. When you select an entry and use the autofill if only one option present, it doesn’t work. It simply adds the one value to the Available options and not into the selected options forcing you to select them and add them to the Selected options. It would be cool if I were able to select 2 or more options in the “Available Options” box and all entries in the second box just transferred to the “Selected options” box. This would allow me to hide the second field “Business Sponsor” in this case so the EU did not have to deal with it and I could still use the values in a workflow. in the Business sponsor box the corresponding entries, “bill and Lisa” are placed in the “Available Options” and not automatically into the “Selected options”. Hope I am making sense. Which version of SPJS-Casc are you using? – I tested, and it does autofill in my test site. I did fix a bug related to this issue in v3.7.13 back in April 2018.